In a sleepy midwestern town... A horrifying evil is about to rise again! If the third time is a charm, the fourth time must be pure terror. In a small, sleepy town in Nebraska, children seem to be transforming overnight. Following the bizarre and eerie words of a mysterious preacher, the town’s young children have a hatred for adults that quickly turns to murder. 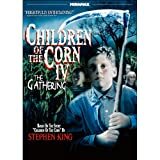 When a young medical student returns to look for answers, she also finds herself trying to save her younger sister, who has started to transform along with the other children of the corn.